After relocating from Houston, TX, Gustavo Albino’s first day at Spreetail in November 2017 was just one of many firsts. New home. New state. New job. During onboarding, new Spreetailers get a tour of the campus, numerous opportunities to make connections with others, and designated time to get acquainted with their team. These activities are all designed to help new employees develop relationships and support systems within Spreetail. Spreetail’s Learning and Development team built the company’s comprehensive onboarding program in October 2017 with the goal of retaining talent, building relationships, and providing a well-rounded business education. 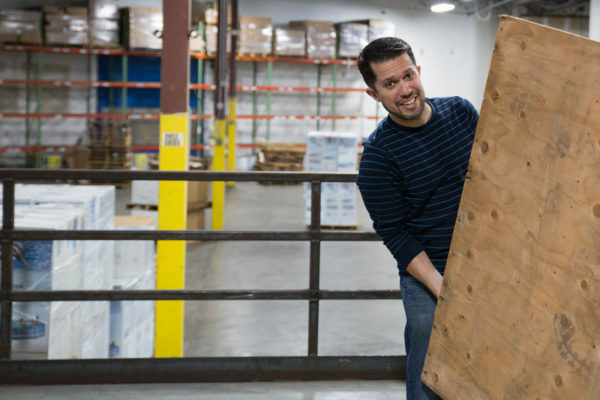 Gustavo Albino works to unload pallets of product into the Spreetail fulfillment center in Lincoln, NE. All new employees complete fulfillment training within their first months at Spreetail. Early on, new hires get exposure into the day-to-day life of Spreetailers across every department, interact with our customers, and even get the chance to see the inner workings of our fulfillment centers. The entire process gives new hires a complete look at the company and sets them up for future success. The Learning and Development team is constantly looking for ways to improve upon the onboarding program. New challenges such as expanding into new office locations and fulfillment centers, bringing in larger onboarding classes, and the addition of new curriculum have added new elements to the program. Nonetheless, the goal remains the same: Bring new hires up to speed as fast as possible, allow them to build deep relationships with others, and help them make an immediate impact. Albino’s advice for those first days at Spreetail, though, is simple. Tyler Schuster is Product Content Specialist at Spreetail, and a Mississippi native with an affinity for the written word. He enjoys content strategy, creative marketing, and real-deal barbecue.